On Thursday evening I sat down in the aging Vogue Theatre amid an audience of harp enthusiasts; admittedly a scene I am not usually privy to. Having gleaned most of my knowledge of harp music from pop culture, I was looking forward to what i hope would be an illuminating evening. The first performance comprised jazz harpist Park Stickney and eclectic composer and harp performer, Rudiger Oppermann, who performed selections from their collaborative CD Harp Summit. 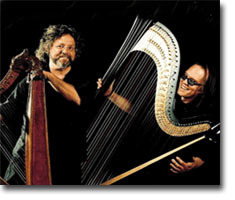 Although their styles and choice of harp differ, I found that they were alike in their interest of playing outside the lines; using innovative technique to create a modern and unique sound. Their performance undoubtedly opened my eyes to the range of music which the harp is capable of. One of their joint pieces was the delightful Caravan and Caravan, a new creation of the jazz standard created by melding two very different versions of the song together. A second and very interesting piece they played together, along with accompaniment, was Jimmy Hendrix If Six was Nine. In this piece the harps were used to create an electric and bass guitar sound; something I had definitely never seen before. Stickney’s hit solo piece paid homage to the well known standard, Debussy Danses. This piece exemplified his fantastic talent, earning him a well deserved standing ovation. Oppermann, for his solo piece, chose a song written by the well known abbess Hildegard von Bingen. Played in traditional bardic style, Oppermann transitioned between the main melody and his own improvisation; in his case by using instruments and an amp to vary the sound of the harp in extraordinary ways. The Eastman Chamber Ensemble, comprising five pedal harpists, performed second in the evening, selecting a composition by the acclaimed Alredo Rolando Ortiz. The style of music was beautiful and elegant, more reminiscent of the harp genre I’m used to. The last group of the evening was the South American trio Duelling Harps, which included Eduardo Betancourt, Celso padre and Celso hijo Duarte. The pieces that they chose took us on an enlivening tour around South America. The set began with a Paraguayan polka performed by the father and son duo, followed closely by Betancourt’s solo piece, which exemplified the type of music found on the boarder of Columbia and Venezuela. Both of these, and especially the latter, stood out for their lightening fast plucking speed, creating upbeat tunes which one could easily imagine dancing to. Duarte, for his solo, chose a classical South American tune, Cascadia, which was written in an attempt to recreate the characteristics of a waterfall. The piece was beautifully done and well appreciated by his audience. While there were many more notable tunes played by this group, perhaps my favourite was their last piece, which took on the form of harp duelling. The harpists took turns at their trade, each trying to overshadow the last; it came down to a battle of speed and accuracy, yet in the end their camaraderie got the best of them and I can’t say with certainty who won. This concert opened my eyes to a world of harp music that I had not previously known existed, and definitely changed my views on the limitations of this instrument. The atmosphere was casual and friendly, and the musicians were of an extraordinary calibre.